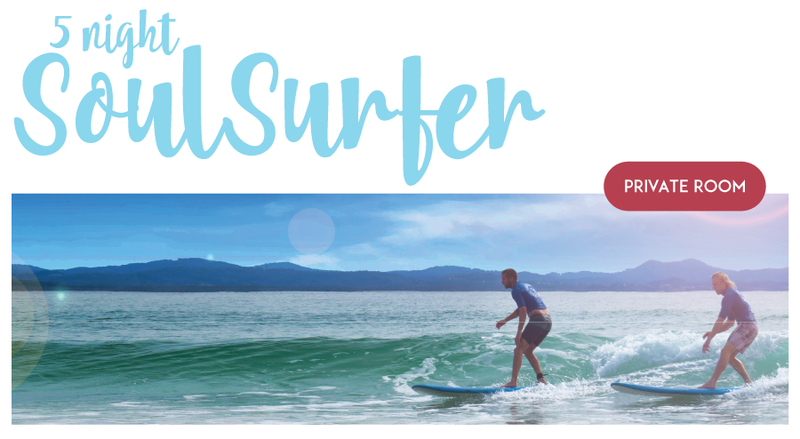 5 Night Private (1 Person) Surf and Stay "The Soul Surfer Package"
We are the only surf school in Byron Bay that has licences in three shires (Byron,Balinna and Tweed this enables us to find you perfect safe learner waves whatever the swell size/direction, wind. The five lessons are a complete introduction to surfing so whether you have never surfed before or want a refresher course we will tailor the experience specifically for you. We will teach you all the necessary steps to get you up and surfing and riding waves in no time at all. Our Instructors use hands on teaching techniques to get you standing very quickly. The five lessons are different each day so you are never taught the same thing twice unless you need a refresher on certain aspects of your surfing. After the session relax in our Byron Bay beachside surf hostel and take advantage of everything that the stunning town of Byron has to offer. Everything from stunning beaches, amazing scenery and wildlife, live music, award winning restaurants and of course the famous Australian weather await you. Enjoy the privacy and sanctuary that one of our modern private rooms offers yet still set within a social hostel to meet new friends.